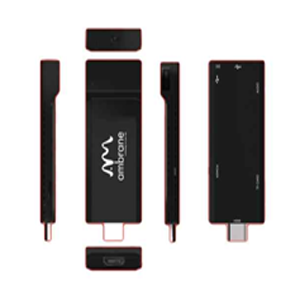 ANDROID TV USB STICK Now convert your LCD or LED TV into ANDROID TV with ANDROID TV USB STICK. It takes power directly from the HDMI port of the lcd / led. You could also connect the HDMI cable between the lcd / led and the device, with the charger to support power supply. This device supports a wireless keyboard (if you do not attach a wireless key board and only attach the wireless mouse then a soft keyboard will appear on the OS) and wireless mouse with the receiver into the usb port of the device. Then with Wi-Fi on watch your lcd / led turn into a smart TV and enjoy all the features of android. Skype, MSN, Yahoo, Facebook, Twitter, MySpace, LinkedIn, etc. only 38 grams and 3 inches in size can easily plug and play. • Can make any TV (even old CRT tv's) a smart Tv running on android 4.0 Ice Cream sandwich. • It has a 1.5 ghz Processor making with 512MB RAM making it a very fast device to be used for daily computing. • The Micro SD Card Slot can support memory up to 32 GB making it appropriate for huge storage capacity. • One click sync to gmail account making over 700000 apps for you to try.